2000 commercial ves sels operate in the Baltic Sea at any given minute throughout the year. Tens of millions of tons of chemicals are transported and the amount of passengers going through the Baltic ports is close to 100 million per year. 100 – 200 incidents are reported involving commercial traffic but the number of near miss situations is many times higher. All this, combined with the increasing amount of traffic in the Baltic Sea, the traffic intersecting at several nodes, difficult waters, and the harsh winter conditions in the northern Baltic Sea increase both the probability of a largescale maritime incident and the difficulty of conducting search and rescue operations. Countries have some national practices for maritime chemical incidents but these incidents call for joint rescue operations and common guidelines. It is important to know how chemicals react in different environments and with other substances, how one should protect oneself against chemicals and how to treat persons having been in contact with HNS, how to handle contaminated gear and vessels. Lack of appropriate knowledge may, in worst case, lead into disastrous consequences. The project will create operational plans and standard operational procedures (SOP) needed in SAR operations of HNS incidents. By creating plans and SOPs for the rescue operations related to maritime HNS incidents the project will tackle the above mentioned lack of operational procedures. By developing the e-learning material for the different international actors in the rescue operations the project will enhance and harmonize the level of knowhow to ensure safe rescue operations. The chemical data bank will act as the basis for information seeking in rescue operations and e-learning. The tabletop exercises and the international rescue exercise/s at sea will test the applicability of the project results in practice. The project will increase the capacities of maritime rescue authorities and services and improve the competence and transnational cooperation capabilities in the Baltic Sea countries. The project partners represent the rescue authorities and services, i.e. the project’s main target groups. This increases the durability of the project results. The project outcome will also benefit other actors, such as environmental and maritime authorities, shipping companies, SAR training and maritime academies and other maritime stakeholders. Total budget 2.4 M€, partly financed by the Interreg Baltic Sea Region Programme. 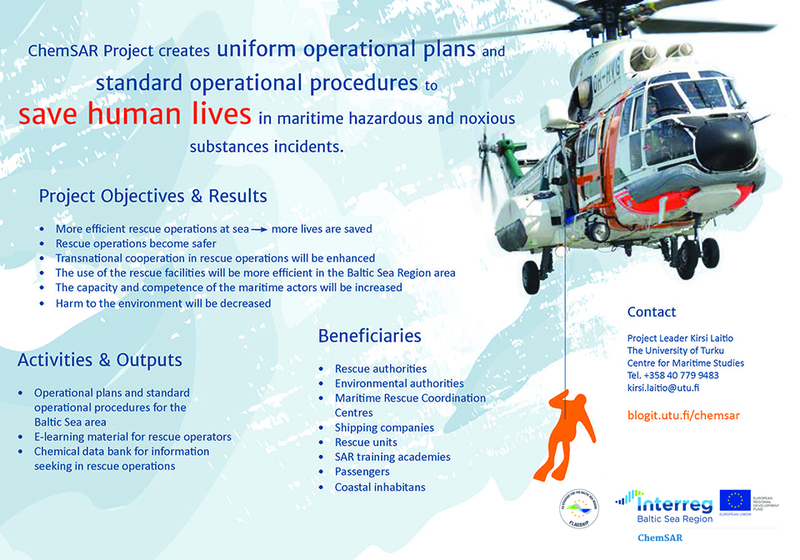 ChemSAR has been granted the label of a flagship project under the Priority Area SAFE in the EU Strategy for the Baltic Sea Region (EUSBSR).